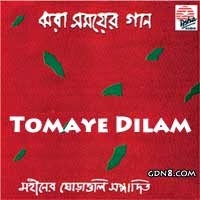 Tomay Dilam Song is Sung by Mohiner Ghoraguli from Jhora Shomoyer Gaan Bengali Album. Tomay Dilam Aaj This Very Famous Bengali Song Sung Many Others Verious Artist. This Song Originaly Composed by Subrata Ghosh, Joyjit Lahiri, Gautam Chattopadhyay and Tapas Das Shohorer Ushnotomo Dine Song Lyrics Sung by Arijit Singh and Female Version Sung by Sharmistha Deb. Aa-jonmo ashyash.. Tomay Dilam Aaj..